Clinical application of DNA microarrays used for screening of single nucleotide polymorphisms (SNPs) are very important for diagnosis of diseases and appropriate treatment of patients. In this paper localized surface plasmon resonance (LSPR) technique has been used to study the DNA hybridization process for binary solutions of respectively perfectly matching (PM) and single base mismatching (MM) 93-mer ssDNA from KRAS codon 12. 5′-thiol modified 35-mer ssDNA has been linked to the Au nanodisks array as probe with a surface coverage of 2.8 ± 0.1 × 1012/cm2. 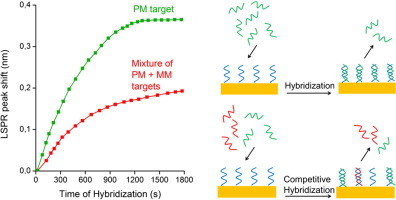 Probe’s binding properties was investigated in details, obtaining a sensitivity down to 10 nM and 13 nM, respectively for PM and MM, showing that the hybridization process occurs at a lower rate for MM with respect to PM target. The competitive hybridization is accounted for by an inhibition model, where the non-complementary sequences kinetically hinder the hybridization of the perfect matching sequences, owing to their above mentioned affinity constant differences for the same probe. Accordingly, the single nucleotide polymorphisms can therefore be revealed in a single step and label free mode with high sensitivity and specificity by LSPR measurements.